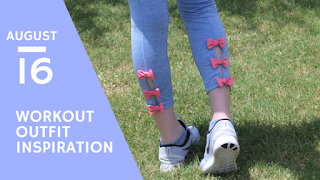 Life as Pink Einstein | Dallas Fashion and Lifestyle Blogger: Workout Outfit Inspiration! Lately I have really enjoyed getting up and working out; it puts me in such a good mood and I feel more productive when I get up and workout. I typically work out in my room because there's not much I can do (such as go to the gym or run) due to the situation with my feet so I'll just throw on a big tee shirt and my pajama shorts to workout but I wore this outfit the other day and I thought it was super cute! This shirt was sent to me in one of my spring Jadelynn Brooke rep boxes and it has been my go-to tee this summer! I love the color combo on the logo and the white tee shirt goes with so many things. I also received these Jadelynn Brooke leggings in a rep box earlier this year and although I loved them I didn't have much use for them besides for sleeping in because I am not someone who wears leggings as pants. When I started working out again I fell in love with them and realized how much use I could get out of them! These adorable bow back leggings have a really nice pocket on each side big enough to fit my phone which automatically makes them a winner for me, I hate having to hold onto my phone. I can't forget to address the super cute bows down the back of the leggings! Bows are my thing and when I found out these leggings have bows on them I was so happy. The bows make these leggings different from any other leggings I've seen which I like.